Our brains are made up of an intricate network of neurons. Understanding the complex neuronal circuits—the connections of these neurons—is important in understanding how our brains process visual information. 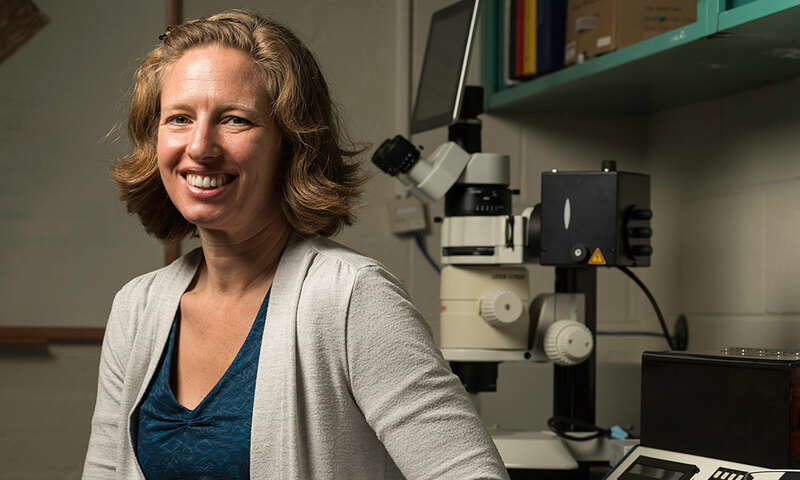 Farran Briggs, a new associate professor of neuroscience and of brain and cognitive sciences at the University of Rochester, studies neuronal circuits in the brain’s vision system and how attention affects the brain’s ability to process visual information. Previously a professor at the Geisel School of Medicine at Dartmouth, Briggs became interested in neuroscience in high school. “I took a class and just became really fascinated by the brain and how it works,” she says. Today, her research on the fundamental levels of vision may provide new insight on impairments associated with attention deficit disorders. What are some of the main questions your lab is trying to answer? I study vision from the perspective of neurons and circuits: How do specific neurons and connections between neurons give rise to visual perception? What is attention, what are the neural mechanisms of attention, and how does attention change the way visual information is processed in the brain? So, you’re studying what happens in the brain to allow us to see? Exactly. I study very low-level aspects of visual processing. Everything I study is completely beneath our conscious awareness. The sections of our brains involved in visual processing operate by initially taking a pixelated image capture of the world around us. Those pixelated image versions are processed in parallel in different channels. In the brain, those parallel image representations are combined in order to create a complete visual percept. Why do we take a pixelated image capture? It’s probably so we can process information very rapidly. The process of taking something, breaking it down into all these parts, and then rebuilding it again gives us a lot of flexibility. But it also means the process is very complicated. My lab is trying to understand the whole process: How do the basics and fundamentals of vision get represented in these early stages of visual processing? What parts of the brain are involved in the early stages of visual processing? The visual thalamus, which is the first structure after the retina to receive visual information, and the next structure in the hierarchy, the first visual cortex. A lot of what we study are the interactions between the thalamus and the cortex—first, to understand how visual perception arises in these very early structures, but also to understand the communication between these structures. It’s not just the visual system that uses this kind of organization; every sensory modality uses a similar organization. We’re also trying to understand how attention changes the way information goes from thalamus to cortex, especially at the cellular level: Can we identify specific cell types that are being facilitated or suppressed by attention, and what are the mechanisms of attention? What types of attention do you study? The main types of attention I study are volitional attention—searching a scene for something—and covert spatial attention—attending to something that is not at the center of your gaze. What is an example of covert spatial attention? Imagine if you were sitting in a bar and there was a person somewhere along the bar whom you found attractive, and you wanted to check them out but you didn’t want to look right at them. That’s covert spatial attention. We think this behavior evolved because primates care a lot about facial expression, but most primate species—human beings are the exception—find direct eye contact to be very threatening. They need to be able to tell if an approaching animal is going to be a threat, but they don’t necessarily want to look directly at the approaching animal. When you are covertly attending, you are really good at detecting small changes at a single location, but you do poorly at detecting things in other locations. This is because attention is a limited resource. Take tasks like reading, for example, where you’re focusing your attention on each word. A lot of mental disorders have an attention deficit component and yet we really don’t understand the neural mechanisms of attention. What kinds of disorders might benefit from your research? Anything from autism to Alzheimer’s to schizophrenia. If we could find a way to undo some of the attention deficits—like in children with attention deficit disorders who don’t do well in school—it wouldn’t cure these disorders, but it would at least improve quality of life. What made you interested in this research? When I was a graduate student, I was trying to understand a wiring diagram of neurons in the visual cortex, but the diagram didn’t take into account what these neurons do for vision. It’s kind of like if you took all of your Facebook friend connections with people in different states. This would give you a really interesting map, but it wouldn’t tell you why those people are your friends or what type of information you share back and forth; it just shows you who you’re physically connected to. The map of neurons in the visual system is fantastic, but without knowing why or what information is being shared, the map isn’t quite as useful. I’m trying to link both neuronal structure and function to study neural circuit interactions that give rise to visual perception.